The plazas surrounding the Vancouver Art Gallery have long been a space for people to socialize, and a place for civic and creative expression. 800-Block Robson Plaza: We have created a design concept for the future plaza based on public and stakeholder feedback. Detailed design for the plaza is in progress; stay tuned for updates. View a slideshow of the high-level design concept for the future plaza. The design concept is based on feedback we heard from residents, businesses, visitors, plaza users, and businesses through consultation. Thank you to everyone who took the time to provide us with feedback about the programming and design of the permanent plaza at 800-block of Robson. The feedback informed the design concept which is flexible and adaptable so that the plaza can accommodate many different uses. Staff will present a report on the design concept to City Council on December 14. Council voted on April 20 to approve a staff recommendation to permanently close 800 Robson Street to all vehicle traffic to create a permanent public square. The design process for the permanent plaza is expected to begin this summer but a construction timeline is not defined at this time. This summer, VIVA Vancouver will once again animate 800 Robson Street for use and enjoyment by the public. November 16, 2015 – You're invited to view the final plaza design for the North Plaza at a community open house. The consultant team and City staff will be on hand to answer your questions. The consultant team has developed a plaza design in response to public feedback on the three concept plans in fall 2013, and has applied for a development permit. Because no single concept plan was preferred, the proposed design includes features that were generally requested or valued: elements of openness and flexibility, seating, trees, and shelter. There was little support for a water feature and the ring was problematic, expensive, and not supported by a majority. January 17, 2014 - In September and October, we invited you to share your thoughts on redesigns for the Vancouver Art Gallery’s North Plaza in downtown Vancouver. We heard from over 900 people, most of whom were very supportive of the open plaza concept reoccurring throughout each design. Find the summary of what we heard under the 'documents' tab. October 23, 2013 - Thank you to everyone who shared their thoughts on the concept plans for North Plaza. Stay tuned to find out what we heard and next steps in the process. October 1, 2013 - If you are unable to attend one of our two October open houses to view the concept plans for North Plaza, you can still tell us what you think about the plan. The questionnaire is available until October 22, 2013. September 24, 2013 - Drop by an open house to see the preliminary concept plan options for the Art Gallery North Plaza. It's your chance to review the proposals and let us know what you think. City staff and consultants will be on hand to answer questions and receive your feedback. Help us create a plaza that’s an inviting, dynamic space for the city that works effectively with the Art Gallery, Robson Square, and the surrounding areas. September 11, 2013 - The City has selected Nick Milkovich Architects (NMA) as the primary consultants for the Vancouver Art Gallery Plaza. Expressions of interest were received from 14 design teams. From the 14 teams, three were selected to submit proposals. The NMA team includes Hapa Collaborative, Matthew Soules Architecture, and Urban Forum Associates (UFA). NMA designed the Roundhouse Turntable Plaza in 2012. Hapa Collaborative designed the new Mid Main Park at 18th & Main; Matthew Soules' most recent work in the area was the 2012 Pop Rocks installation on Robson Street; and Lance Berelowitz of UFA is the author of Dream City, Vancouver and the Global Imagination. September 3, 2013 - The VIVA Summertime Plaza has been removed from 800-block Robson. The street is open to traffic. June 22, 2013 - The City, in collaboration with TransLink, held its first public consultations as part of the Downtown Vancouver Local Bus Service Review. The review includes the #5 Robson bus. June 14, 2013 - Check out the 2013 VIVA Summertime Plaza at 800-block Robson from June 22 to September 2. During this time, 800-block Robson will be temporarily closed to traffic. City staff will be monitoring the impact to traffic and pedestrians. January 25, 2013 - VIVA Vancouver is seeking designs from Vancouver’s creative community! As per Council’s direction, staff prepare for a summertime public plaza on 800 Robson Street, launching in late June 2013. NOTE: Public concerns regarding the #5 Robson bus re-route are under review with TransLink. November 28, 2012 - City Council approves staff recommendations to temporarily re-open 800-block Robson Street to vehicle traffic on 1 December 2012 until the summer seasonal closure. City staff will continue to work on addressing issues raised by the public on challenges and opportunities for creating a permanent public square at this location. Read the full staff report in the Documents tab. Read the summary of the public consultation in the Details tab. Our public consultation events, held at the Vancouver Art Gallery, are now complete. Read the Details tab to get summaries of these two events. We want to hear from you. Help shape the future of Block 51.Your feedback will be included in the report to City Council on 800-block Robson and will be given to the designers of the Vancouver Art Gallery North Plaza. Vancouver Art Gallery, 7:00-10:00 p.m.
Short and inspirational presentations will look at how this block has been used over the last few years and draw on inspiration from other cities. Read the final summary of this event in the Details tab. The 1973 National Film Board film “Chairs for Lovers” and a panel with members of the original team for Robson Square will set the context of how this block came to be. Read the final summary of this event in the Details tab. October 4, 2012 - City staff are currently consulting with key stakeholders, including the Downtown Vancouver Business Improvement Association and TransLink. This report summarizes the input from the two open houses, an online questionnaire, and stakeholder meetings. Staff report to Council "800 Robson Street: Creation of a Permanent Plaza"
Staff report to Council "800 Robson Street: Strategy for Moving Towards a Public Plaza"
Staff are continuing to work with key stakeholders on the issues identified in the following report to Council. The City’s transportation plan, Transportation 2040, includes policies and actions to enable: an active and healthy city, a reduction in traffic collisions to support a safe city, an accessible city for people of all ages and abilities, a range of options to help create a more affordable city, a vibrant public realm to foster a lively city, and a resilient city prepared to deal with global issues and unexpected events. During the Transportation 2040 Phase 2 consultation program in the summer of 2012, over 10,000 people participated . The most common suggestions to support walking were to provide wider sidewalks and more public spaces. Click "Show more" next to the project that you want to learn more about, below, for project details. The City is investigating creating a permanent pedestrian plaza. For the last three summers, 800-block Robson has been transformed into a pedestrian plaza for the VIVA Vancouver Program. Recognizing the success of the summer closures, in September 2012, Council decided to close the block to vehicle traffic until the end of 2012, and asked City staff to investigate the public's interest in using the space as a permanent pedestrian plaza. The road re-opened to vehicle traffic in January 2013, while the investigation continued and VIVA Vancouver created another temporary plaza for summer 2013. The investigation into the feasibility of creating a permanent square will continue until the end of the year and includes the Downtown Bus Service Review, which is scheduled to conclude in late 2013. The City is redeveloping the Vancouver Art Gallery's North Plaza. 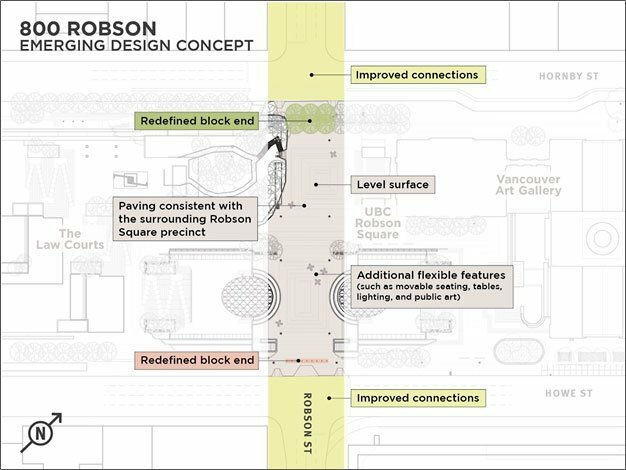 The goal of the City is to create a plaza that reflects the needs and desires of the public, respects its location at the historical entry to the Vancouver Art Gallery building and its relationship to Robson Square. will be used to help redesign the site. Prior to construction of the North Plaza, which is expected in 2014, a Development Permit will be required and the public will be consulted on the design. The North Plaza is owned by the Province of BC and leased to the City for use. Activities on the North Plaza are currently coordinated by the City. The Province of BC must approve any changes the City proposes to make to the North Plaza and is responsible for the maintenance of the fountain and the area immediately around it. 28 November 2012 - In summary of the Block 51 consultation, the City hosted two public events at the Vancouver Art Gallery seeking ideas on how both sides of Block 51 could be used in the future. The events were attended by 165 people and participants worked with architect Stanley King’s Co-design team. Illustrated ideas around use of space were then incorporated into an online and intercept survey, which was open to the public from November 1-12th, 2012. This resulted in over 2100 completed surveys. One of the key findings from the survey was that 64% of respondents had a preference for 800-block Robson to function as a permanent public space, while 17% preferred a summertime public space and 19% preferred only occasional closures of the street to traffic for special events. The City hosted a stakeholder workshop on October 4, 2012, which was attended by 22 people representing a broad range of stakeholders, including TransLink, business associations, public space and active transportation advocates, the adjacent Robson Square facilities, seniors living in the West End, Tourism Vancouver, the local design community, the Province, and the Court Services Branch. Based on the key issues raised, staff conducted four smaller, more focused stakeholder meetings throughout the Fall with youth, the downtown and west end business communities, the adjacent Robson Square facilities, and seniors living in the West End. The key issues identified by stakeholders on the creation of a year-round public square relate to: 1) the downtown transportation network, 2) the overall ‘look and feel’ or design of the space and 3) programming for the space. The resolution of these issues is critical to the long term success of a permanent public square, thus demanding a flexible and incremental approach to planning. 15 October 2012 - Public event - “A Look Back”: Hosted by CBC Radio 1’s Shiral Tobin, included a screening of the 1973 National Film Board of Canada film Chairs for Lovers. This was followed by a panel conversation with Stanley King, local architect who led a similar Co-Design process in the 1970s to gather input on the Robson Square development, as well as members of Arthur Erickson’s design team for Robson Square, Bing Thom, Alan Bell, and Nick Milkovich. 17 October 2012 - Public event - “A Look Forward”: Hosted by local inter/multi-disciplinary artist Vanessa Richards, included short and inspirational presentations that explored how this block has been used over the years, while drawing on experience from other cities. Both events ended in a Co-Design process, led by Stanley King, where artists illustrated participant’s thoughts on what future uses the 800-block of Robson and the Vancouver Art Gallery North Plaza could accommodate. These events were presented in partnership with Spacing Magazine, the Vancouver Public Space Network and the Vancouver Art Gallery. The business community, including the Robson Street Business Improvement Association, Downtown Vancouver Business Improvement Association and West End Business Improvement Association. Robson Square facilities, including the Vancouver Art Gallery, UBC Robson Square, the Law Courts and the Province. Click "Show more" next to the project that you want to learn more about, below, for project background. The block was first closed to vehicles during the 2010 Winter Games. Staff continue to investigate the feasibility of a permanent public plaza through monitoring and data collection. During the summer of 2011, 2012 and 2013, 800-block Robson was closed to vehicle traffic and became a pedestrian plaza hosting unique seating and events under the VIVA Vancouver Program. In 2010 December, Council directed staff to examine the creation of a public square in the 800-block of Robson. During the 2010 Winter Games, 800-block Robson was closed to vehicle traffic and became a pedestrian plaza for Games events. The North Plaza opened in 1911 as a courthouse. In 2011, funds were requested from the 2012-2014 City budget for the redevelopment of the plaza and the re-waterproofing of the underground spaces of the Art Gallery. In 1966-1967, it was redeveloped with a different style of landscaping and to accommodate the fountain. Since then. changes have been small and incremental. In 1911, the courthouse, now the Vancouver Art Gallery, was completed and the plaza was used for large ceremonies. VIVA Vancouver is a program that transforms road spaces into vibrant spaces for walking and gathering. The City of Vancouver is working with Translink to develop a short term vision for the bus network in the downtown core.